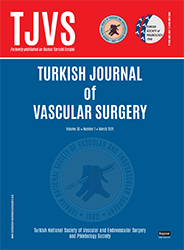 2İstanbul Üniversitesi, İstanbul Tıp Fakittesi, Göğüs Kalp ve Damar Cerrahisi ABD, İstanbul (Analysis ef arıerial and venous system pressures of arteriovenous fistula} Early patency of aderiovenous fistulae for hernodiaiysis is affected by various factors. Ona of Ihem is stenosis or obst¬ruclion in the venous system. The aim of thls study is to expose the effect of stenosis in the venous system to 1he early patency of arteriovencus fistula with measuring of venous system pressure. We perlormed 410 arteriovenous listulae cases in the Department of Thoracic and Cardiovascular Surgery at the Me¬dical Faculty ot Istanbul University in 1997, and we measured venous system pressure in 15 cases peroperativeiy, which we had chosen at random. 11 of them were snuft-box fistula, 3 were brescia-simino and 1 of them was brachial arteriovenous fistula. The ava¬rage systolic yemin pressure was 35.8 mmHg and systolo-diastolic pressure gradient was 3.4 mmHg in 10 patients, which had thrill. The average systolic venous pressure was 51.3 mmHg and systole-diastoiic pressure gradient was increased to 42 mmHg in 5 patients which had not a thrill.